WRRA Peruvian Tanganyika is a outstanding female. She produces fleece lengths that are not the norm. Tanganyika has terrific bone density, conformation, fineness and coverage. She is an easy breeder, birther and milker. 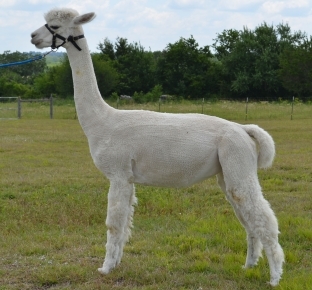 Tanganyika's 2018 cria is a beautiful white girl sired by Xanadu P Adorno. She is has the fineness and brightness of her sire and is progressing very well.